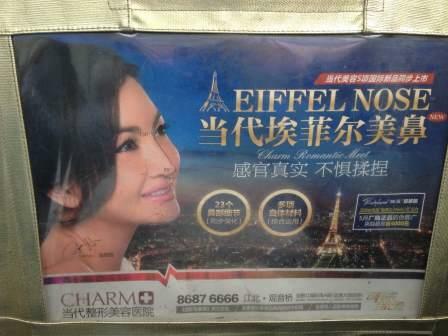 Would You Pay a Plastic Surgeon for an Eiffel (Tower) Nose? 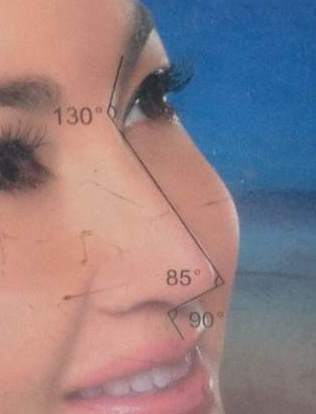 A close-up of the model’s nose suggests that the surgeon in question has given serious thought to the precise measurements that create a genuine Eiffel Nose (and tower). And presumably, the model is living proof that he can pull it off. So why would one want an Eiffel Nose? My guess is that nobody really does. Rather, a particularly industrious cosmetic surgeon decided that he needed some way to distinguish his clinic from the other 34,000 cosmetic surgery institutions that are competing in China’s booming cosmetic surgery industry. Then again, considering the work that some surgeons have been commissioned to do, I wouldn’t be surprised if there were takers out there, after all. This entry was posted in Architecture, Health by Adam. Bookmark the permalink.